In the late 12th century, the city of Paris, with its university and cathedral, was unequaled as a center of music and learning. The musical innovations achieved at Notre Dame and the abbey of St. Martial laid the groundwork for many important developments in music, including polyphony, rhythmic notation, and metrical organization of melody. This recording features 16 works from this period, by both known composers at Notre Dame--Leonin and Perotin--and unknown ones working in monastic anonymity at St. Martial. Although relatively austere and harmonically limited, these revolutionary pieces-- inspired in part by the majesty of the new cathedral buildings built during the 12th century--have an incredible range of emotion, from passionate declamations to intensely moving florid lines. The performances by Paul Hillier and his superb singers are resonant, warm, dynamic, and rhythmically exciting, recorded with spacious sound that preserves the detail of the vocal parts. 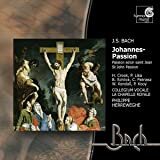 When the Te Deum and Mass were first recorded in the mid-1950s, they introduced many listeners to a French Baroque master of the highest level. Today these works, along with the beautiful Litanies, retain their power to charm and amaze. Charpentier's church music is one of the largest bodies of unknown masterworks in the literature of music. From the grandeur of trumpets and drums to the beautiful intimacy of the vocal recitatives, this is deeply satisfying music. The old recordings, overinflated and inauthentic, seemed to have more grandeur than the modern, state-of-the-art, stylistically aware versions. But Christie and his ensemble do truly beautiful work for Charpentier, with fine, transparent recording and complete texts in the booklet. Machaut's mass is one of the great masterpieces of the Middle Ages. Machaut was a man of many talents whose music represents a point of momentous transition from medieval practice to the emerging Renaissance. This four-voice work, the earliest of its kind by a known composer, is difficult to perform, not because of the notes, but because of questions concerning interpretation of the notation. You'll notice striking differences between Ensemble Organum's performance and every other available version. This group, known for its meticulous scholarship and performance perfectionism, sings in a style that sacrifices modern ideas about vocal purity and beauty in favor of what they believe to be a more authentic 14th-century style. This involves lots of micro-tonal slides and numerous fluttering, nervous ornaments, often done by more than one voice at a time, and a sort of "pushed" vocal quality that some listeners may find strange. Strange, maybe, but it's unique and it's convincing.